It had been 15 years since I had successfully used any piece of fitness equipment. It was a special day. 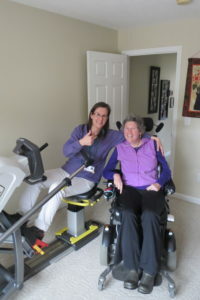 Ellen Corindia, who was diagnosed with ALS in 2001, details how a brief meeting and a goodwill gesture gave her the chance to use a piece of fitness equipment for the first time in 15 years. I was introduced to SCIFIT in a miraculous way this past March. My caregiver and I made the trip from New Hampshire to Orlando to attend the BASH for Augie’s Quest. The BASH is an amazing event that raises money for ALS research (also known as Lou Gehrig’s disease). It is the big party of the week during the IHRSA convention—one of the largest shows held for the fitness industry each year. I have had ALS since 2001 and find the fitness industry’s efforts to raise money for research incredibly hopeful. We were there to support that cause and attend the BASH. We were at the reception to honor major sponsors the night before the BASH and my talking computer crashed, which I need because I cannot speak clearly. By spelling out words and a few charades, I got across to my caregiver that I wanted to thank Chris Clawson, the president of Life Fitness, for supporting ALS research. The following morning we wove our way through all the spotlights featuring new equipment and made it to the Life Fitness area. We spoke briefly with a young man and explained that we were sent here by Chris Clawson to try some accessible equipment. Keep in mind, there were approximately three wheelchair users in the entire convention center. One was me in a power wheelchair. Another was my buddy, Augie Nieto, who also has ALS in a power wheelchair. The third person was a super buff guy that looked like he could walk upside down in a handstand. We were guided to the SCIFIT area and introduced to Corey Disler. Within ten seconds he had the seat off of a StepOne and was instructing me to pull up to the machine. I was shocked that we didn’t have to transfer me out of my wheelchair and onto the equipment. My caregiver flipped my wheelchair armrests up and positioned my feet on the pedals. My leg muscles are quite strong, I just don’t have any balance. My arms are very weak, but I have enough grip to hang on to the handlebars. It felt amazing to feel my legs moving and pulling my arms along in sync. 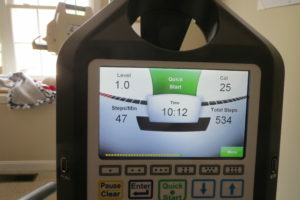 It was simply spectacular to find a piece of fitness equipment and actually be able to use it despite having a serious neuromuscular disease. I couldn’t stop smiling and laughing. My successful exercise experience quickly became a curiosity among trade show attendees in the area. They were nodding their heads, likely thinking how much sense it makes to allow for exercise directly from a wheelchair. It had been 15 years since I had successfully used any piece of fitness equipment. It was a special day. I couldn’t stop smiling and laughing. I wrote an email to thank Chris for introducing me to SCIFIT and to inquire about who I should talk to about getting one. He immediately he wrote back saying Life Fitness and SCIFIT would like to donate a StepOne to keep me moving! It has been very helpful to keep my joints moving and to buoy my spirits. I can see Mount Monadnock out the window, so I have been keeping track of the vertical feet each time I work out to see when I have stepped enough to have climbed the mountain. SCIFIT is now a verb in our house. We don’t say, “I’m going to work out.” We say, “I am gonna SCIFIT for a while.” That just sounds more fun. So far, the StepOne has been an incredible tool to keep me moving and preserve the function I have. It has also been fun to help my friends with spinal cord injuries use the StepOne. 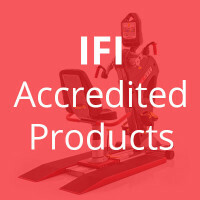 Because of our great experiences, we are working together to convince fitness centers in our area to purchase SCIFIT accessible equipment. Thank you SCIFIT and Life Fitness!